Consumers these days want eco-friendly goods, and manufacturers are rushing to make their products recycleable, or to use recycled materials, or to use materials that won’t hurt the enviornment. Here is an example of a wallpaper brand (Designer Wallpapers) that boasts of using water-based inks, recycleable paper, and an acrylic coating (as opposed to the vinyl coatings used just a few years ago). This went in an under-the-stairs powder room in an older home in West University Place, Houston. The blotchiness is due to the paper still being wet; it will disappear as the paper dries. 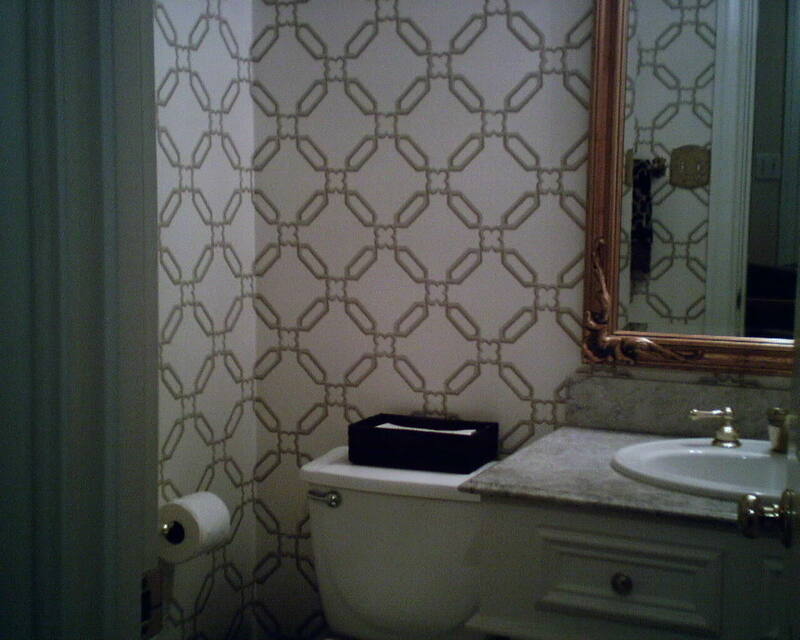 Farrow & Ball Wallpaper – Changing Color?? Now the sample that’s in my folder is definately greyish GREEN. 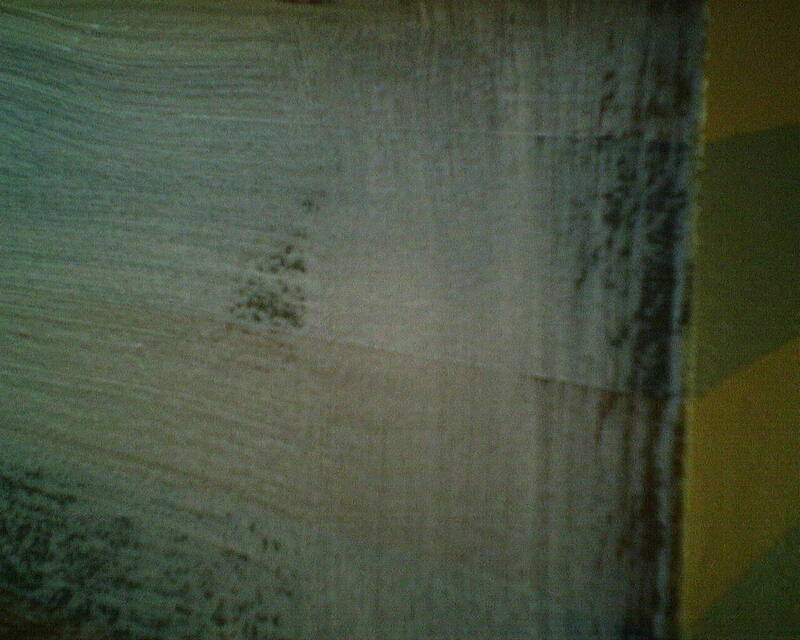 I’m wondering if, since F&B uses paint instead of ink or dye, the colors fade if not exposed to light – like oil based enamel will do on your woodwork. And if it does, what happens to wallpaper in a room setting? What if one wall gets more light than others? What about furniture set against a wall, blocking light? The concept of eco-friendly water-based paint is a good idea – but hopefully it will perform well and continue to display the color that the homeowners want in their décor. So you plot ahead of time to put the last, unmatched corner in the least conspicuous spot, usually over an entry door. With some patterns, there are little tricks you can do to disguise it, but usually you’re just stuck with a somewhat-but-hopefully-not-disagreeable pattern mis-match. I think this one I did today turned out pretty darned well. The biggest challenge was keeping the horizontal lines at the same height. You see, walls are never plumb, and corners are never straight. So as you go around the room, the pattern can move up or down on the wall. This one did, too. On the right side of the wall, one of the black horizontal lines was 2 1/4″ from the ceiling, and on the left side of the wall, the lines were at 2.” I wanted the horizontal lines to match up, but moving such a strong visual element up or down can be tricky. Not only do you want them to match each other side-to-side, but you want them to be at the same distance from the ceiling and from the tops of doors and windows. Your eye will definately notice if the distances are off. What I did today turned out nicely. Can you see the hexagon that is slightly wider than the others, with the double vertical line? The fact that it’s smack in the middle of the corner helps fool the eye. It doesn’t pop out at you, the horizontal lines match up, and the elements along the top of the door and at the ceiling are equal heights, so the mis-match is not too noticeable. Wallpaper on Extreme Home Makeover – My Buddies Put It Up!! Some of my friends (Bill Armstrong, to be specfic, from Knoxville, TN) from the National Guild of Professional Paperhangers (NGPP) installed the wallpaper and murals you see in the background of many rooms in this news clip. I met with a number of clients yesterday, measuring and bidding their wallpaper projects. One of the men (doing a mighty fine job of rehabbing a 1905 house in the Heights), said that he has tackled wallpaper in the past, having taken the Houston Community College wallpaper class – some 30 years ago! Well, I used to teach that class… But I taught starting 25 or so years back, and the man didn’t remember me as the teacher, so must surely he had another instructor back then. That Owner Builder Center probram, BTW, was run by Tom Tynan, the guy who went on to fame as Houston’s handyman on the radio Saturday mornings. Well, Thanksgiving is behind us, but I’m not back to work yet. I took the week off to work on outside projects, same as I did last year. 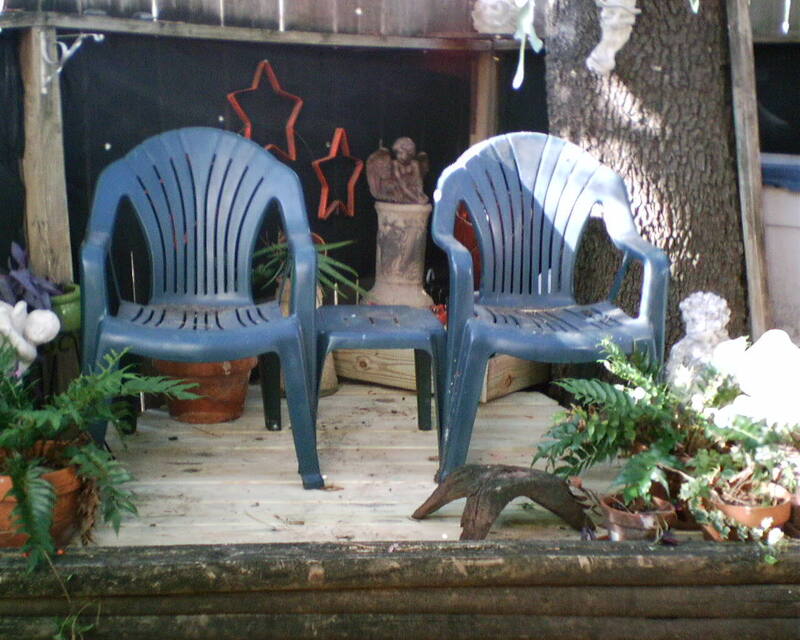 Last year I tore out my back deck and a smaller deck under my Live Oak tree. Spent the entire week rebuilding the larger deck and adding outdoor wiring – six light fixtures, three of which operate by switches, five double-gang outlets…. Doesn’t sound like all that much, but each one of those outdoor electrical boxes is quite tedious and labor-intensivee to install. This year I had multiple smaller projects. 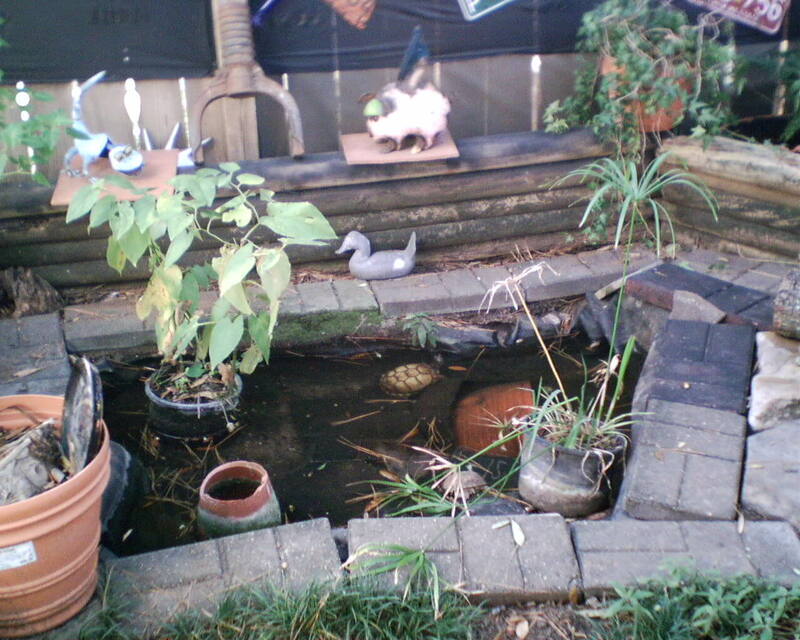 I have already rebuilt the retaining wall along the beds by the street, and reconfigured and reinforced the turtle pond. Yesterday was Parade and Feast Day. Today is back to work – Today’s project is building that smaller deck that I tore out last year but ran out of time to build the new one. All materials are purchased, tools are at the ready…I just need to turn off the computer, feed the critters, and get outside and to work! Tomorrow is for working on my Holiday Newsletter and sorting Christmas gifts…. Which I didn’t get to. It took too much time “finishing up little things” on the yard projects. But that’s OK – there’ll be time (at some point) to get to the cards and letter. 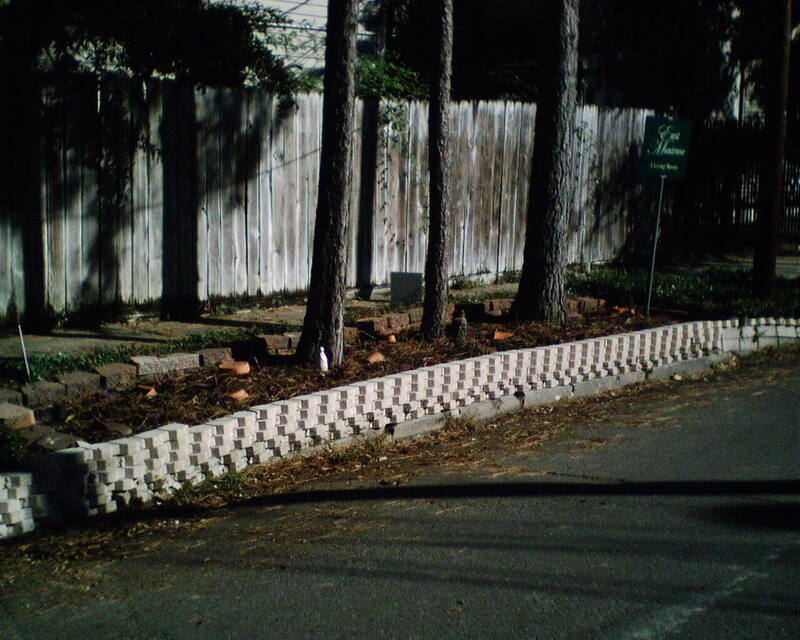 At left are shots of the deck, small but three-tiered and sturdy, a nice spot to sit under my Live Oak tree; part of the retaining wall – just let someone try to run over and knock down THAT wall; and finally the turtle pond, not fancy, but functional and hopefully safe from raccoons and other predators, and reinforced with enough concrete block that they can no longer dig under the liner and cause erosion problems. The Novemer 2012 issue of Southern Living Magazine is all about serving fancy dinners in fancy dining rooms. There is a several-page spread showing how several interior designers have styled their dining spaces. Wallpaper?! What’s on that ceiling is way beyond regular wallpaper! From the looks of it, I’d say it’s real gold leaf, possibly the Vahallan brand, or something similar. Instead of strips that span the room, it appears to be squares or blocks of material, pieced together in a planned pattern. It looks kind of swirly and cloud-like, but in a gold color. It’s light enough to not crowd in on the room, and the mottely motif certainly adds patina. Truely magnificant. You can find nature-themed designs, such as this by Thibaut: http://www.thibautdesign.com/collection/old_collection.php?productID=3728&patternID=632 . 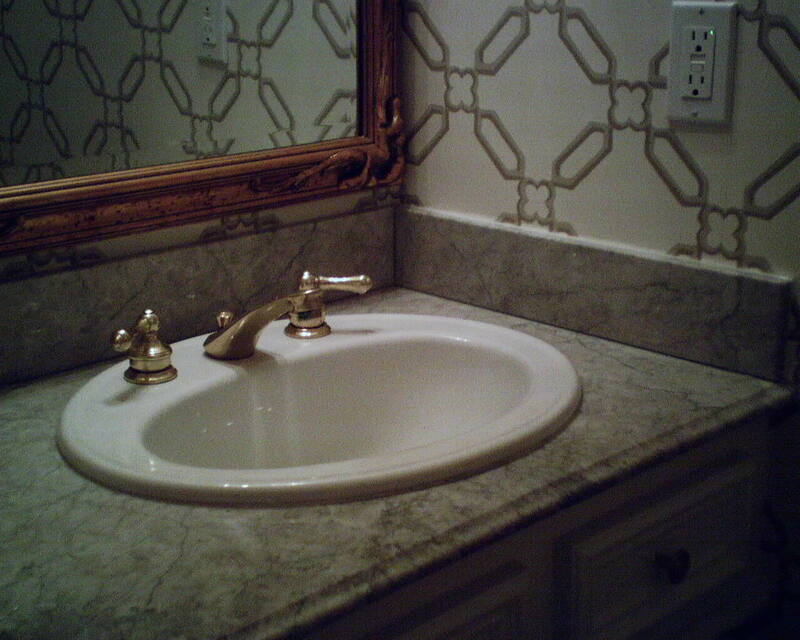 I hung this very pattern in the Raspberry color, in a Heights area powder room, just last year. OK, HARD to see, but an important thing to be aware of. Some stripes had been painted on the wall, which you can see around the corner, at the right of the photo, and you can see them covered by my primer on the left side of the photo. The stripes had been painted using blue painter’s tape to keep the lines straight. When the tape was removed, there were very faint ridges at the joints where the two colors met. You can just barely see them at the right side of the white primed area. So? Well, depending on the pattern, composition, and thickness of a wallpaper that would be put over this, those ridges just might show under the paper! Some people would never notice, but, in the right (or wrong!) light, I think this sort of thing is pretty visible. The solution would be to sand or scrape the ridges down, or, if that doesn’t work, to float over them and sand smooth. Then prime and hang the paper. Over yesterday and today, I put this in an under-the stairs powder room of a soon-to-be-married couple in the West University area. The homeowners loved it! Although I would prefer a quieter look (meaning, paint), many people love wallpaper on the ceiling of these small rooms. 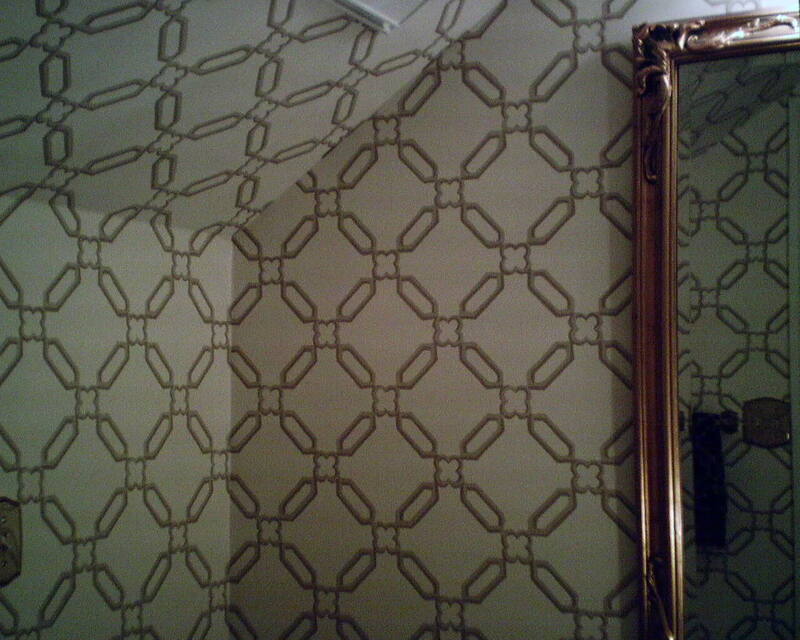 When doing this treatment with ANY pattern, it’s important to keep in mind that, as it works its way up the ceiling, the pattern will match on only ONE wall. From there on out, it falls where it falls! Observe the photos to see what I mean. With the right pattern, it’s not a big deal. For instance, the toile I posted photos of a few months back turned out great. And this trellis, even with some mis-matches, looks very good. A pattern that would not work as well would be, let’s say, figures of animals or people, that would be turned upside down as they travel across the ceiling, or would have their heads, for example, cut off. Ouch! You are currently browsing the Wallpaperlady's Blog blog archives for November, 2012.